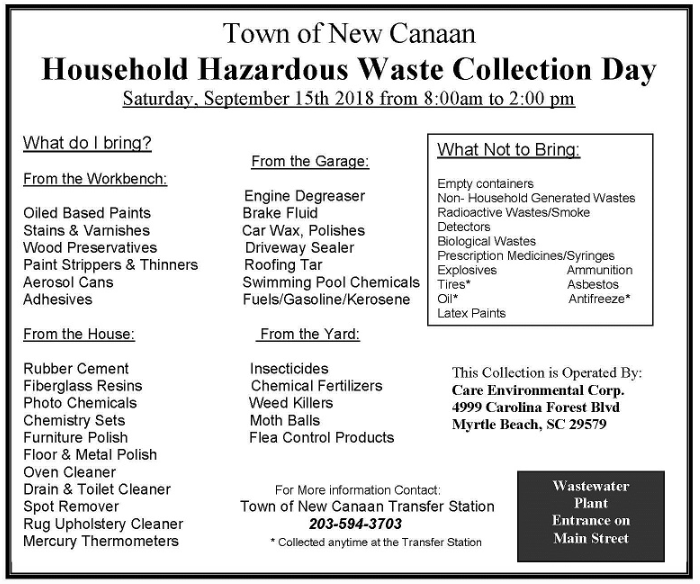 Darien residents are invited to drop off their household hazardous waste in New Canaan on Saturday, Sept. 15, at no charge. Farther away, there’s a household hazardous waste drop-off event scheduled for the following Saturday, Sept. 22, in Westport. The final drop-off event available to Darienites for this year will be on Oct. 13 in Wilton. New Canaan Public Works Department will hold a household hazardous waste collection from 8 a.m. to 2 p.m. Saturday, Sept. 15 at the Wastewater Treatment Plant located at 394 Main St.
Household hazardous wastes are any products that can be classified as toxic, corrosive, flammable or reactive and can be found in most homes, garages and workshops. Ninety-nine percent of all hazardous material is disposed of in incinerators designed for this purpose. Residents are urged to make plans now to organize specific items for transportation to the collection area. The drop-off site will be open to New Canaan residents along with surrounding area Towns that have recently formed a recycling group. Group members are as follows: Darien, Greenwich, New Canaan, Norwalk, Stamford, Weston, Westport and Wilton. Identification, such as driver’s license will be required. No materials produced from a commercial establishment will be accepted! Please note that New Canaan will not be accepting any paints from Darien,Stamford,Westport or Wilton. These towns have the availability to take paints to stores that receive old paints through the Paint Care Program. Contact your Public Works Departments for a list of stores that will accept old paints. Surrounding towns will be billed accordingly. the Wilton Miller-Driscoll School 217 Wolfpit Road on Oct. 13 from 9 a.m. to 1 p.m.
Jim Rogers, Superintendent at the New Canaan Wastewater Plant, has urged residents to heed the following rules. • Bring materials in original containers securely closed. • Pack containers in a sturdy up­right box or boxes and pad with newspaper if necessary. • Never mix chemicals together. • Never smoke or eat while handling hazardous materials. • Leaking or broken containers must be contained. • Officials at drop-off sites will remove materials. Do not leave vehicle unless asked to do so. Residents will not be charged for the disposal. Please direct all questions to the New Canaan Transfer Station at 203-594-3701. Garbage haulers have requested that none of these materials are to be left for them to pick up. Residents must bring the materials to the drop off site themselves. Editor’s note: This article originally was published Sept. 7. The time stamp was changed to put the link to the article back on the home page and in the Darienite.com newsletter.